Today I want to share part of an article found at Avon's website: BeautyforaPurpose.com. 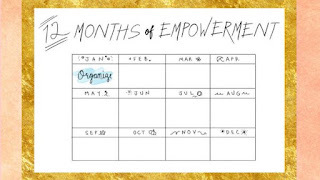 Since January is almost over, there are just a few more days to "Organize," which seems to be a common goal of people at the start of the new year, judging by posts I see on Facebook. This article has some tips that may help you along that line. Do you think having your own home based business might help you meet your goals financially? Contact me to learn the reasons Avon could be the best business for you. Or, if you are a motivated self-starter, go ahead and get going with your business today at smoore.avonrepresentative.com/opportunity/start! Bowling says investing in yourself—whether that means preparing for retirement or going back to school—is the best thing you can do with your money. And Rapley advises that if you’re in a sound financial position, you shouldn’t be afraid to invest in something you love that won’t necessarily earn cash back.